WRESTLE-1 has seen somewhat of a resurgence over the past few months. After several months of poor booking and forgettable in-ring work, things are finally coming together for W-1. The company returned to Korakuen Hall one month removed from a successful January 10 show — were they able to trump that and put on an even better show? Were they able to keep the ball rolling and pick up even more steam, or were the past few months just a fluke? Kotaro Suzuki made his WRESTLE-1 debut on January 10 and immediately challenge Hiroshi Yamato to a match for the cruiserweight championship, which Yamato defeated Andy Wu for just moments before. I’ve been following for Suzuki for some time now; I loved him in NOAH, I liked most of his All Japan run, and as a fan of his, I think this is a good spot for him. He’s not under contract, he’s just a freelancer, but there are a lot of good matches in store for him IF he’s here for the long run. Kuroshio is going through a series of singles matches these next few weeks/months, assuming he’ll only have the matches on big shows like these. His first opponent is none other than Ultimo Dragon, who’s been in All Japan these past few years but makes occasional appearances in Michinoku Pro and various other promotions in Japan, the UK, America, and of course, Mexico. He’s not the wrestler he once was, but he’s still exceptionally good and can have great matches, as shown here. Kuroshio is so over, and this series of matches is only going to help. They have to be establishing him as a top player in the company in one way or another. So what do I see happening? I see them giving him all these big opponents, such as Dragon and such as Daisuke Sekimoto (his opponent on March 13), having him lose all the matches and then win the last one, which, as I said, should get him even more over. Kotaro Suzuki challenged Yamato after the match, as expected. They’ll have a match on March 13th. These two started feuding when they broke up as a tag team in All Japan. Sanada went on excursion in the summer of 2013 and announced that he wouldn’t be coming back to All Japan, while KAI left to join Mutoh’s splinter promotion, WRESTLE-1. 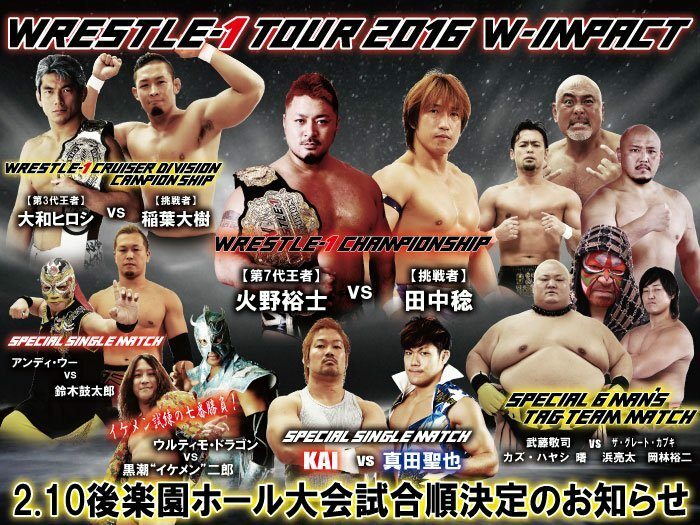 Sanada made a surprise return to Japan in September at the debut W-1 show, where he lost to KAI. A few days later, they had a rematch, where Sanada got his win back. They had a handful of singles matches ranging from 2008 to 2012, not apart of any sort of feud, so they know each other pretty well and have decent to good chemistry (I probably enjoyed their previous matches more than most). This was unlike any other match they’ve had together. It was more of a walk and brawl type of match, which makes sense given KAI’s new character and there still being some bad blood between the two. The first several minutes saw KAI take him through the crowd, smacking his head into the walls and pushing him around. Once they got into the ring, they exchanged some slaps and some strikes, Sanada eventually coming out on top after landing a top rope moonsault, which felt pretty flat but didn’t take anything away from the match. Sanada seems to be working a lot of WRESTLE-1 shows in the future, but I’m not too sure whether he’s agreed to sign a contract or not. As for KAI, I look forward to seeing what the future holds for him, because these changes have done him well. While walking to the back, Mutoh and Hayashi were stopped by former All Japan rookie Keiichi Sato, who said that he wanted to compete in WRESTLE-1 as a direct understudy of Kotaro Suzuki. He was booked for the show on March 13th. Shuji Kondo came out and challenged Hino, so he gets the next shot. KAZMA SAKAMOTO then came out and stated that he and Hino were to gun for the W-1 tag straps, currently held by Kondo and Masayuki Kono. Final Thoughts: This show was on a similar level as the January 10 show. The important matches delivered and the undercard was at least watchable. WRESTLE-1 is in a good spot right now and continue to pick up steam, so get on board if haven’t already.